We made our decision; the destination is determined. We begin here and are determined to go there. The plan is the plan. We made it and begin the process of working it. However, it isn’t always that easy. My limited understanding doesn’t allow for sideroads, construction zones, and detours. I get confused and assume the worse when things aren’t turning out the way I planed. When the road is longer than expected and more confusing than anticipated, I begin to wonder where I erred. When we longingly look for the light at the end of the tunnel or we can’t find room in the inn, I wonder where we took a wrong turn. When the miles add up to more than the map showed, I begin to question the journey. Because it’s not about my plan. It’s about His plan. And He who created a good work in me will carry it on to completion until the day of Christ Jesus. He knows where I am; He knows the way that I take. He has already gone before me. If I get sidetracked, He patiently redirects my steps until I am back on the path. No matter how many times it happens, He pulls me back to the road again. And finally I will be home. It made me think of all the different hats and titles I’ve worn during my adult years. Here are a few of them. As I look at that list, I perceive that life keeps changing. Duh! It’s so easy to see that looking backward but not so easy moving forward into it at a new turn in the road. Sometimes a dead-end forced me to branch off toward the unfamiliar and scary. At other times the prospect was a dream I had never dared to pursue. All of them took courage I didn’t think I possessed. Many times I felt I was drowning because I didn’t know what I was doing. Often I prayed for wisdom and to learn quickly. And I found that courage comes when we do what we fear. I’ve learned more from the journey than I ever did in the classroom. Some things can’t be taught, only experienced. Each hat I wore brought knowledge I would not trade, though some I certainly would not want to relive. As an old commercial reverberates, “You’ve come a long way, baby.” And I guess I have. I expect, and rightly so, that there will be more roadblocks, more dead ends, more Ys in the road, more choices and hats to try on, more days to learn and grow. The fact is, I never invented or re-invented myself at all. I am a project in the making, a vessel of clay that is continually being molded and conformed, mended and repaired. God’s hand moves the wheel of my forming, using the good, the bad, and the ugly to make me more and more into the image He wants. It is the model of Jesus He is pressing for. I am His project and He is committed to complete it. At this place on my journey, I am confident of this: God will do what God will do. He is the sovereign Lord in charge of all of creation. If I try to resist His remaking of me, I will find myself kicking against His plan, not a place I want to be. There is surrender in this process. A daily call to crucify my flesh and its desires. A continual seeking to know His will and the courage to walk in it even when I am afraid. What kind of hats have your worn? Which hat are you wearing now? “Life’s a journey. Enjoy the ride” was a commercial slogan from a Toyota campaign a number of years ago. It appealed to me so much that I have made it a life motto of sorts. I guess I was born with a personality type that tends to look at the glass half full, trying to glean the sunshine from experiences, even when it is raining. Please don’t think I am a practically perfect Pollyanna who has mastered the Glad Game she played to deal with her disappointments. I have had my mully-grubs, my bought with depression, my pity parties, and my “gloom, despair, and agony on me” days. Still, the journey has been strewn with a vast array of joy, beauty, and friendships; an abundance of love coming from so many directions; and most of all the knowledge of the ever-present God. This year, our road has taken some detours. I’ve been sidetracked and had to re-calculate my map. There was no use trying to turn around and go a different way. We cannot go back, can we? Only forward. The journey Sweet William and I have been on lately has been rocky and rugged at times, to say the least. The mountains have looked impassable and the waters too deep to cross over. But God . . . (I love that phrase!) . . . but God has poured grace upon grace and so often given the oil of gladness for the spirit of heaviness. Now we face yet another recovery process after yet another surgery this year. Complications have already threatened my plan and upset my apple cart. The splendor of fall still glowing. 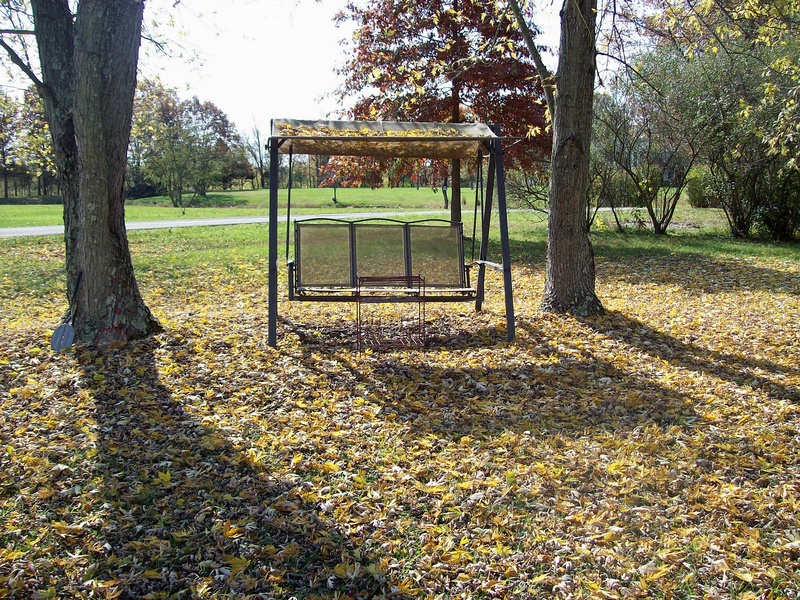 The yellow carpet of Maple leaves underneath the front-yard swing. Our Bradford Pear tree that stands strong and tall after so many years whose leave just now turn red and are waiting to be enjoyed. 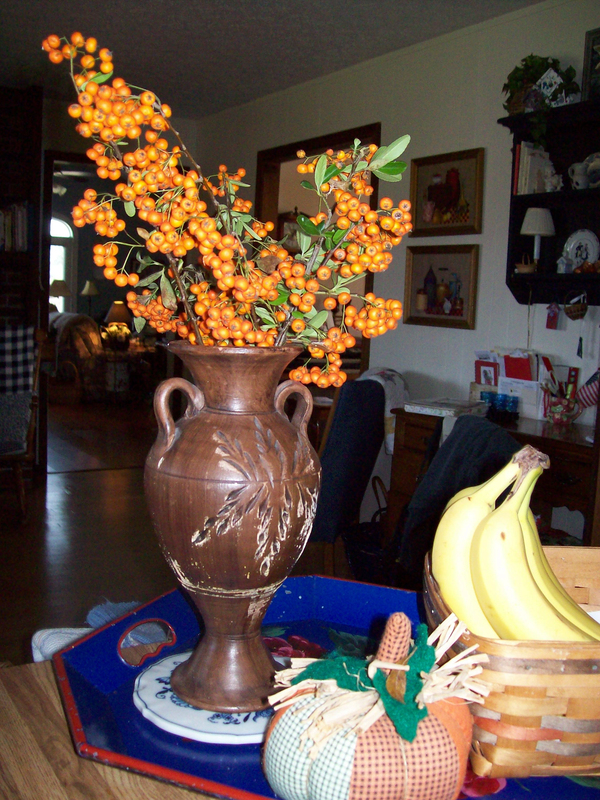 The orange berries on the shrub that grows by the garage, some of its branches cut and gracing a vase on the kitchen counter. Roses stubornly blooming in the front yard. Friends who call, send cards, and express their love in so many ways. Strength in my own body. A warm house and food to eat. A washing machine that just keeps washing. Our Maltese Buddy who greets me when I return home with the enthusiasm only matched by my grandchildren. The newest member of the household, Gus the cat, whose purring machine turns on as soon as I reach out to touch him. Sweet William who smiles through the pain and thanks me for all I do. Kind, efficient, and knowledgeable medical professionals. Family close by I can call when I am in need. The distraction of work I enjoy. Piano students who brighten an otherwise cloudy day. 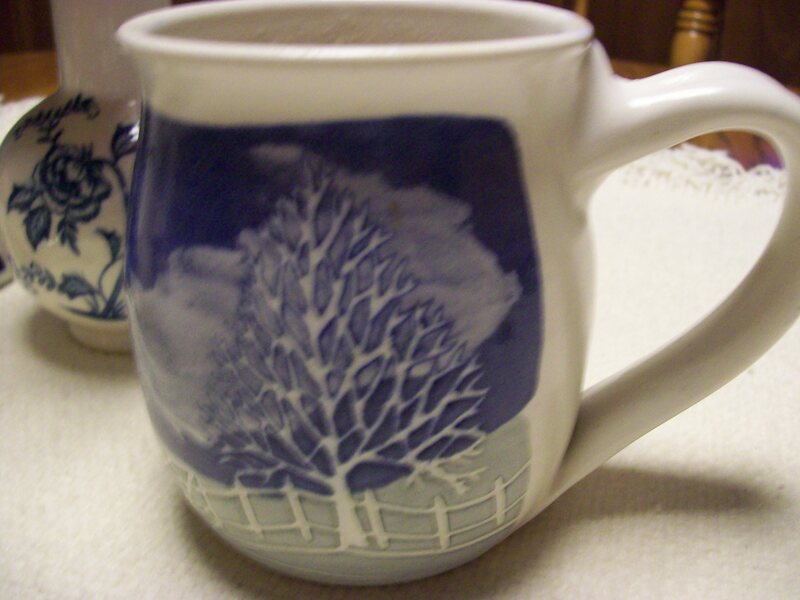 A really good cup of coffee with half and half cream. Hearing my Dad say he’s praying for Bill and me throughout the day. The assurance of my salvation, that nothing or no one can ever separate me from the love of God because of Christ Jesus. A good Word from Holy Writ, God’s personal message to me. Being able to cry my tears, knowing my Father understands. I could count more, and I do for they are always falling down to earth from God’s hand, mercies that are new every morning, just waiting to be noticed and appreciated. Life will present me with more rough roads, places under construction, warnings to slow down and be cautions because danger lies ahead. Such is man’s destiny in a world longing for its own deliverance. But the journey is not to be dreaded or faced with fear. It is journey God promises to walk with me, a journey Jesus himself paved for me. It will be filled with trials and temptations. But it will also be filled with blessings untold. It is a ride of a lifetime, one to be enjoyed and savored. I don’t want to miss it. All four of the Gospels report that Passover was approaching as their stories lead us to the eventful days preceding Jesus’ crucifixion. The feast of Passover was and is significant to the entire account. We associate Passover with the Israelites’ departure from Egyptian slavery found in Exodus 12. The Lord appointed this time to be the beginning of a new year for His people. On the tenth day of this month, they were to take a lamb, separate it from the flock, and designate it as their Passover lamb. From the 10th day until the 14th day, the lamb would be examined for any blemish or defect, because the lamb to be slain had to be perfect. On the 14th day, guided by very specific instructions, the people prepared a meal on the night they would be granted their freedom. The Pascal (Passover) lamb was a central element in that meal, and its blood was put on the door frame and lintel of each Jewish dwelling so that the death angel would “pass over” them. Passover continued to be a major feast throughout the Old Testament and was very much a part of Jesus’ heritage. As this particular Passover approached, Jesus life was about to climax. 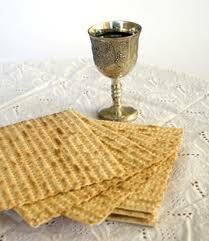 We know from Scripture that Jesus “earnestly desired to eat this Passover” with his disciples (Luke 12:15). As the days led up to this celebration, Jesus told His disciples that he would suffer and die. He tried to prepare them, but they would hear none of it. They protested the very thought. Jesus knew this Passover would be His last one on earth. He knew He would complete this festival through his death. The shadow of things from the Old Testament was about to be fulfilled in Him. There were other thoughts about this Passover, thoughts from those who sought to arrest Jesus. They wanted Him off the streets and out of their hair. They were making plans how they could take Him, but they said, “It must not be during the Feast” of Passover for fear the people might riot (Mark 14:2 emphasis mine). To fully comprehend the significance of the Passover holiday as it relates to our season of Easter’s resurrection, we must see in it the picture of Jesus, the Lamb who was slain from the foundation of the world. While we don’t know the exact date of Jesus birth, we can know with certainty that His death was during Passover as the gospel writers give us the detail of the time and the season. That sacred journey almost 2000 years ago would have been the 10th day of the first month of the Jewish new year, the day each family picked out a lamb for their Passover supper. On that day, Jesus allowed Himself to be proclaimed as the Messiah that was to come. He essentially was “picked out” to be the Passover Lamb. This is the first in a series on the Passover. I hope you will come again. I would love to hear your comments.